The Dornier Do 29 was an experimental aircraft developed by Dornier Flugzeugwerke and the Deutsche Versuchsanstalt fx�r Luftfahrt (German Aviation Laboratory) in the 1950s, used to test a tilting-propeller system for short takeoff and landing aircraft. The concept was proved to be successful in flight testing, however no further development of the system or aircraft was proceeded with, and at the conclusion of its test program the Do 29 was retired. 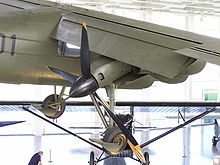 During the Second World War, Heinrich Focke of Focke-Achgelis, a manufacturer of helicopters, developed a design for a short-takeoff-and-landing (STOL) aircraft that would utilise a system of pusher propellers, one on each wing in a pusher configuration, to provide downwards thrust and enhance lift. Designated Fa 269, the design was not developed due to the state of the war. In the 1950s, however, a renewed interest in STOL and VTOL aircraft led to a re-evaluation of Focke's concept, and Dornier was given a contract to develop an aircraft capable of demonstrating the tilting-propeller system. The aircraft, given the designation Do 29, was based on the Do 27 light transport, modified with twin Lycoming GO-480 engines mounted below the wings. These engines drove three-bladed, pusher propellers, that were capable of being tilted downwards to an angle of up to 90 degrees, and the engines were coupled so that symmetrical thrust could be maintained in the event of an engine failure. The forward fuselage was also modified with a helicopter-like cockpit. A Martin-Baker ejection seat was provided for pilot escape in the event of a crash. Two examples of the Do 29 were constructed, while a third was planned but not built, with the first protoype flying on 12 December 1958. In the following flight testing, the propeller system was not rotated further than 60 degrees as opposed to its nominal 90 degree capability, but the aircraft proved to be highly successful, with a stalling speed of 24 kilometres per hour (15 mph) and exceptional short-field performance. Despite this, however, the tilting-propeller system was not further pursued after the end of the flight test program. 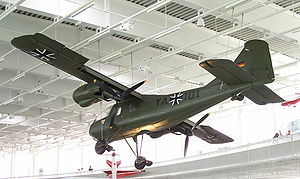 One of the Do 29 prototypes survived the program, and is displayed in the Dornier Museum in Germany. Green, William. Observer's book of aircraft (1960 ed.). London: Frederick Warne & Co. Ltd..